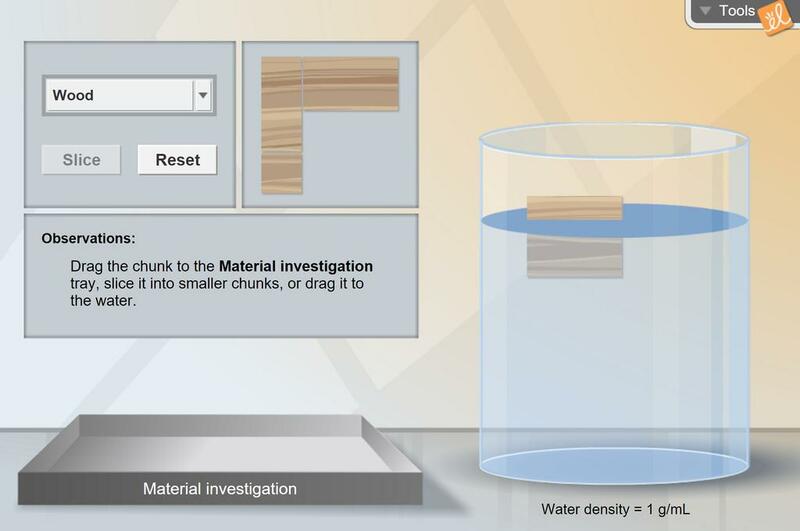 Drop a chunk of material in a beaker of water and observe whether it sinks or floats. Cut the chunk into smaller pieces of any size, and observe what happens as they are dropped in the beaker. The mass and volume of each chunk can be measured to gain a clear understanding of density and buoyancy. This spreadsheet graphs mass vs. volume and displays the equation of the linear regression line of the da... (more)ta. The slope of the regression line represents the density of the substance. Use this to show students where the equation for density comes from and to show that density is a property of matter. This is the same lesson as provided except I replaced the charts with Excel so students can use Excel to ... (more)make their density calculations. It is meant for students to use when they are filling out their forms electronically rather than using a hard copy. Students will use the Density Slice and Dice gizmo will be used to reinforce the concept that density is ... (more)a characteristic properties. Very helpful in teaching students how to calculate density and to start to understand Specific Gravity. Volume and mass are major density misconceptions and this Gizmo can help! This is useful for reinforcing the idea that density is a characteristic property of a substance.